Are social media shares and press the fast track to success and riches? One artist shares her story. On paper, having your artwork go viral online seems like the express ticket to success. If a piece of art gets shared by popular news outlets and social media pages, that means the creator is set to be inundated with 'likes' and new fans clamouring to buy their work, right? Not quite. While viral art, by its nature, can garner a lot of attention, the journey to fame is not as straightforward as it seems. In a similar way to how sharing timely and talented fan art can get you paid, an image that goes viral can make artists money. But talking about the finances is tricky at the best of times. Chuck internet stardom into the mix and it becomes even more difficult to untangle exactly how much cash your art going viral brings in. To clear things up, illustrator Lucy Bellwood broke down the numbers behind her Art of the Sailor artwork, above, in a blog post. 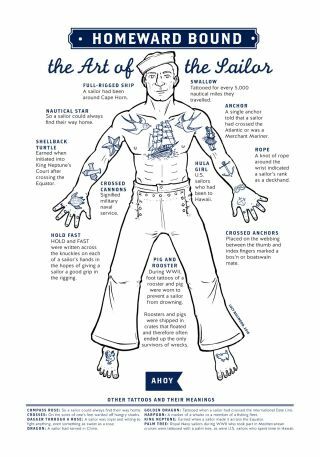 The illustration, which details the different types of tattoos that sailors wear and explains what they mean, has enjoyed viral success and when Bellwood wrote the blog post in May 2017, it had earned her $1,761.50. However, the image's timeline can be traced back all the way to February 2013. It was back in 2013, thanks to an introduction from fellow cartoonist Tony Cliff, that Bellwood landed a commission to do an illustration for the Vancouver Maritime Museum. The museum was running an exhibit on the history of tattoos and scrimshaw, and needed a poster that showed off some of the most popular choices. Bellwood jumped at the opportunity. "I was just starting out in 2013, didn't know the first thing about contracts, and was happy just to work on a project that reflected my personal passions and gave me a relevant platform," Bellwood tells Creative Bloq. At this point she had no idea how popular the illustration would become, so she just quoted her hourly rate of $35, did the work across five and a half hours, and filed an invoice for the job. This also meant that she didn't specify purchasing rights, which could complicate things if she wanted to sell reproductions of the image later down the line. And selling prints is exactly what Bellwood did over the next two years. Thanks to a tour of the exhibition in 2014, the sailor tattoo poster started to get interest from curators at other maritime museums. This meant that she had to sort out who owned what if she wanted to capitalise on the illustration. "Since we had no written agreement I retained all the rights to my illustration, but it's complex: I collaborated with a designer! Technically we both own a slice of that image. "Everyone was amenable to the idea of producing posters to sell, so I was able to go ahead with the plan. I think you can still behave ethically and considerately even if you don't have a contract." Having a contract is the biggest lesson Bellwood has learned from the whole experience. Although considering that cultural institutions like regional maritime museums work with a small budget, she says she might have been tempted to waive the fee on this occasion. "I don't think it hurts to pay it forward," she says. "I don't carry some huge grudge about having "missed out" on remuneration from those exhibits." However, the poster's growing popularity did prompt Bellwood's parents to suggest that she should've demanded more for her services. "I'm not one to disagree when people want to pay me more money," she jokes, "But I also think context is important. After all, it's been four years. Of course I charge more now. I'm a more skilful artist than I was in 2013, and I'm also far more savvy about business than I was back then. The challenge of being a freelancer is being responsible for your own raises." Between 2014 and 2017, Bellwood sold the original illustration of the sailor to a fan for $125 and paid Twin Ravens Press to produce 100 letterpress prints of the poster. These were originally offered up as rewards for a Kickstarter pledge for funding a book of her Baggywrinkles maritime comic series, but they were also taken to conventions. At $40, they proved to be too expensive for a lot of shoppers, although they did manage to bring in an extra $480. From here, she went on to produce regular laser print posters and distributed print-on-demand versions from her site with the help of INPRNT. Thanks to INPRNT taking a substantial cut of each sale, these only brought in $10 profit. During this time the poster appeared on military and naval social media pages and racked up an impressive number of reactions and comments. Frustratingly though, appearing on social media pages didn't contribute hugely to sales, but in 2017 an appearance on Boing Boing meant things started to take off. With roughly 10 million page views per month, the feature on Boing Boing led other sites such as My Modern Met to also publish the poster. This in turn led to more sites and pages running the illustration, culminating in the likes of George Takei and Chris Hadfield posting it on their social media and web pages. Not only that, but thanks to Boing Boing carefully providing links to both the letterpress poster and the print-on-demand version in Bellwood's shop, a sizeable chunk of the artwork's overall profit of $1,761.50, specifically $814, came from that story about it. At the end of November 2017, the rush of interest in the illustration started to taper off, but Bellwood found a second wind (or was it a third or fourth wind?) by writing about her viral experience on her Patreon page. Thanks to its transparency, the post was met with an enthusiastic reaction from other artists and illustrators. "The creative economy I'm a part of depends on human connection," says Bellwood, talking about why the post went down so well. "An image divorced from context may have the power to capture people's interest, but a contextualised human being has the power to create a bond. "I'm not in the business of trying to turbo-maximise the number of eyeballs on my work (although it's always a neat thing when it happens). I'm in the business of building relationships." Bellwood is keen to remind other artists that building a relationship relies on their own efforts, as well as hoping for positive feedback from going viral. "Attention is an opportunity, not a concluded transaction. It's the opening of a door. It's up to you to welcome people at the doorway and usher them through to being invested in your work and who you are. List your full name and contact info prominently on your website. Make it as easy as possible for people to get to you, learn about what you do, and give you money from any platform you use on the web: this means keeping info updated on social media, personal pages, and everything in-between." Yet despite her brushes with viral fame, Bellwood doesn't consider herself a 'viral artist'. "My stock in trade doesn't rest on regularly having my work reach a wide swath of the internet," she reveals. "I've had maybe three or four instances of this kind of attention, and every time it evokes a sort of bemused surprise. I find myself saying 'Well, this is interesting!' a lot, and then moving on, because my primary effort is focused on connecting with the people who follow me, which means writing about my experiences and welcoming people into my process. "I think folks who consistently 'go viral' are often working on a much more reliable release schedule, both in timing and format. It’s a question of content, but also of consistency." Buy The Art of the Sailor letterpress print here, or as giclée art prints here.